The past few days I have been building stuff, but yesterday I got back to doing what I feel more at home with - breaking stuff with hammers. 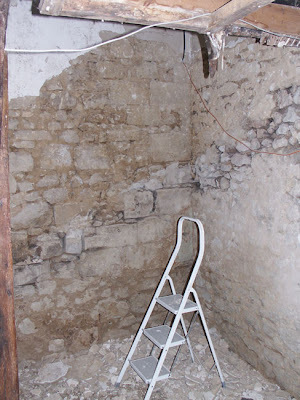 After chipping away some of the plaster in the stairwell the other day, I decided that it would be a good area for us to "feature" some stonework. I also realised that the menuisier would probably be happier putting the staircase up to walls unencumbered by plaster and render. This means that on the hottest day of the year so far (31º and counting), with all the shutters shut to keep out the heat, I was up a ladder bashing stuff with a mason's pick. I may not have been dressed for the part; shorts, t-shirt and carpet slippers, but I was effective. I wasn't using the Electric Destroyer, so I didn't feel the need for protective clothing. Today and Wednesday are supposed to be even hotter, so I will only be working before lunch - before the western side of the house starts to heat up. I will be shifting the rubble from yesterday out of the stairwell, before chipping some more off, and this afternoon I plan to be, as one of our neighbours put it last night, a mouse hiding in my hole if it is as hot as yesterday. After dinner we went to the Jardin to water. EDF have re-sited some wires that used to go across the garden - we are not sure when, but the wires were still strung the day I had to prune the nectarine tree. This makes our garden even more attractive. 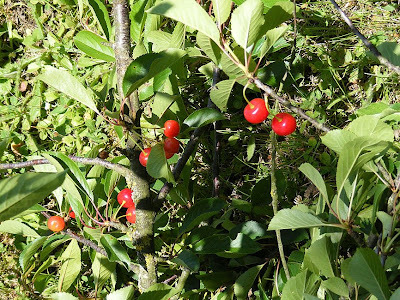 The cherries have just about finished - there is probably half a tree's worth of sour cherries to pick, then we can weed the veggies until the peaches, plums or nectarines (whichever comes first) need dealing with. Another very hot dry day yesterday dawned and we got up grateful to now have a functioning shower. Alex was due at 9am to help with the cementing of the staircase base* and he arrived just as I had made coffee. I left the two blokes to do building work and went out into the garden to pot up some seedlings I had promised to Alex's wife Nicole. As I walked past the front of the courtyard I realised there was a gap where a box ball in a pot should be. The courtyard garden, a week ago. Geranium 'Gravetye Blue' is at lower centre. Sadly, during the night, someone had succumbed to temptation and stolen a box ball and the Geranium 'Gravetye Blue'. 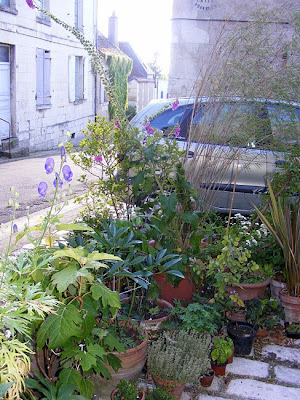 It made me want to cry, but it wasn't totally unexpected – we knew putting the plants out in a courtyard open to the street like this was a risk. The florist in town used to leave all her plants out on the street overnight, but this year, no longer does. The telltale gap, where a box ball in a pot should be. The Gendarmerie is in a compound on the other side of the river and you have to buzz to get let in. I told my story to Gendarme-Adjoint** Améry, who was professional enough to not give any hint that he thought that dealing with two stolen plants and a middle aged Australian woman with inadequate French language skills, dressed in not very flattering shorts, was not his idea of a productively spent Sunday afternoon. He will let me know if he hears anything. Back at home we tossed around ideas for protecting the plants. Any fence we erected would have to be clearly temporary, and therefore almost certainly ugly. 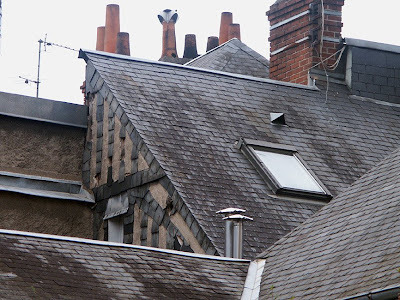 We cannot enclose the area or erect anything permanent without the permission of Bâtiment de France, who would take months to make a decision. In the end it was Sylvie who came up with the cunning plan to foil future plant thieves. She suggested running a chain along the pots and fastening each of them to the chain. We didn't have a chain, but we did have some fencing wire because we need to make a trellis for some Boysenberries we've planted in the verger / potager. Stringing the pots together with wire. 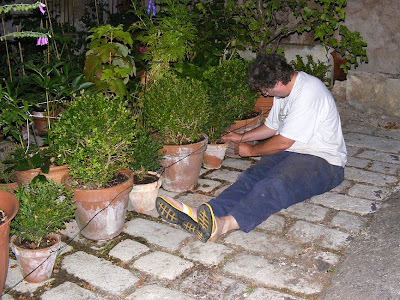 So Simon drilled a hole in each of the pots and we've run a wire along the line of pots. Each pot is fastened to the line by a twitch of wire. 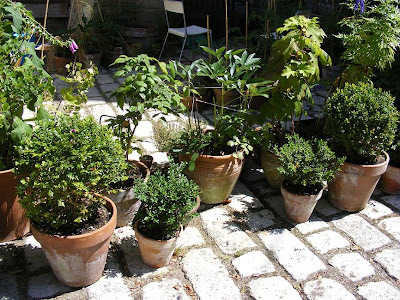 A determined thief could still make off with our plants, but taking the pots too will be awkward and time consuming, as they are all strung together now. Hopefully it will not be too much of a nuisance for us if we want to move a pot. * A big thank you to Alex for helping with this at short notice and on a Sunday. There is nothing in my training as a musician to prepare me for laying cement. quite deep in places, but not very wide. The hole was the site of a timber framed, wattle and daub filled wall. You can see the bottom of a rotted away post on the left hand end of the hole. If my theory (expounded here) about our staircase is correct, then this would have been an entry hall or porch to the house. After digging out the rotting timber, loose stones and old concrete, I dug out (metaphorically, at least) the bag of cement I bought last year and stored in the garage, a shovel and a mason's mixing bowl. The small hole is now filled, but not very well - I think I got the recipe wrong. This threw me, so I rang Alex who will be doing out garden wall, and he agreed to come over this morning and assist me with the landing pad for the staircase - a much more important and possibly more difficult job. 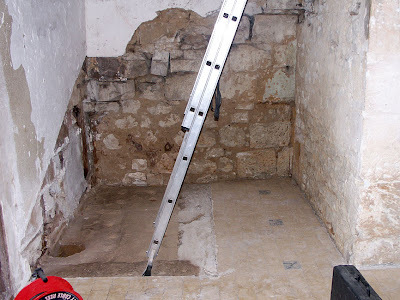 I mentioned on Thursday that the menuisier had called to have a look at where our staircase will go and update the devis. While he was here we talked about where the stairs will land. So that he can get all the treads even we need to know where the floor level will be and to actually lay a floor to the correct level for him to place the stairs on. 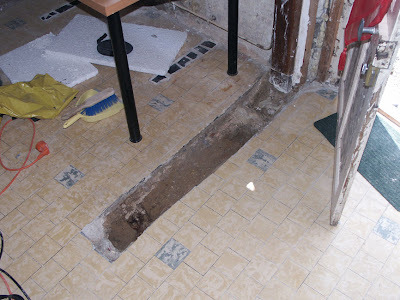 Whilst most of the old kitchen/dining room/whatever has been laid in modern cement tiles, there are one or two patches where the tiles stop short. One of these is where the staircase will land. 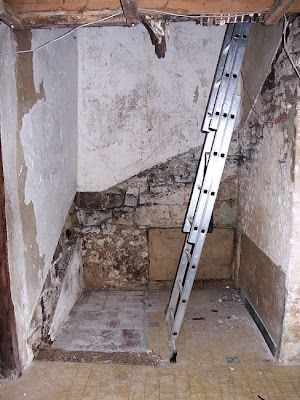 The tiles were put in place (rather quite well, actually) after the old staircase was in place, and beautifully cut around where the bottom step was. The plan is to bring the patches without tiles up to the level of the top of the tiles with a cement pad. So - yesterday morning I started with my electric destroyer (an SDS drill, actually) chipping away a row of tiles and some of the stuff (no idea - cement dust? sand? rotten stone?) underneath. This is where I had intended finishing, but on a whim I decided to chisel down further to make the concrete pad thicker and less likely to flake. I also took off some nasty cement render from the walls, and another patch of poorly laid cement floor that was where a wall once was. Next step is to find some levels and lay some cement. Yesterday afternoon we went to the garden to pick some cherries (we haven't forgotten), water the garden, and see what has developed. It looks like we should have a good crop of chillies and tomatoes and some aubergine, and the courgette are coming on a treat. All we need in addition to our crops to make ratatouille will be some garlic - fingers crossed! *I have no idea either. 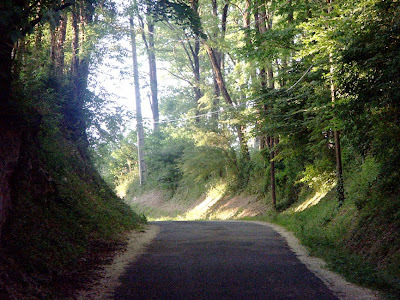 This is a variation on one of our favorite walks. 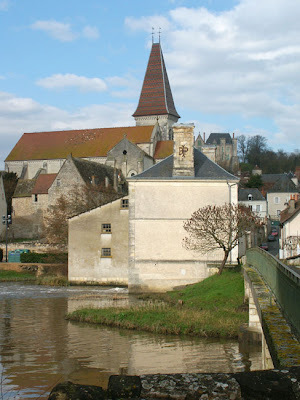 One of the points of interest is that you walk the full length of the old main street of Preuilly, from the Roman bridge, past the chateau, to the road to Martizay. Starting at the Mairie you head downhill toward the huge plane trees on Champ du Foire. This takes you past the junior school to one of the two footbridges across the Claise. From here you follow the bank of the Claise until you come to the gate into the caravan park. Once you pass the toilet block there is a set of steps descending to the plan d'eau. 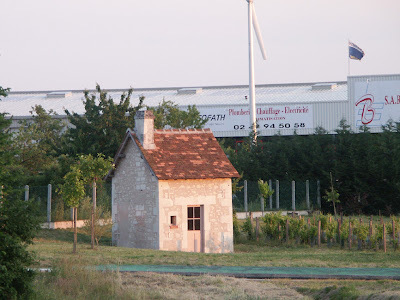 This is where our Bastille day fireworks are held, as well as events like the annual brocante and town dinners. Walking past the lake on the plan d'eau you reach a road - turning left here will take you to what looks like a boat ramp - the little island in the river here is the buttress of a Roman bridge. 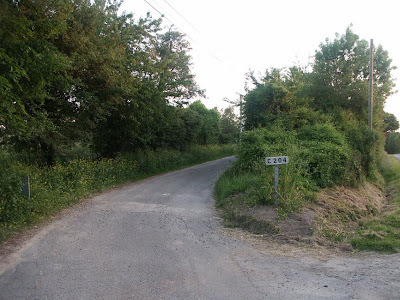 From here, you head uphill and continue uphill - through the arboretum (formerly Preuilly's graveyard) and its chapel, to the start of what was once Preuilly's main road. Take the left hand fork and walk past former shopfronts, now houses, many of them being lovingly restored. Eventually you will reach the Poterne - the old gatehouse of the chateau, now the museum of the Preuilly Archeological Society, then from here it's downhill all the way. Once you reach the bottom of the hill turn right back towards the tower of the Abbaye. 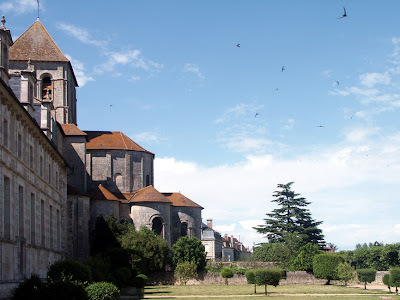 Here you have a choice to make: you can walk down past the mill, across the other footbridge across the Claise, then back along the main road; or continue past the Abbaye back to the Mairie. The map is marked in yellow here. *At least, I don't think we have, anyway. Yesterday was a quiet day for us after visiting Ken and Walt on Tuesday. Although we were careful about how much we drank because of the hour long drive home, we both caught a bit of the sun and so arrived home feeling not the best. 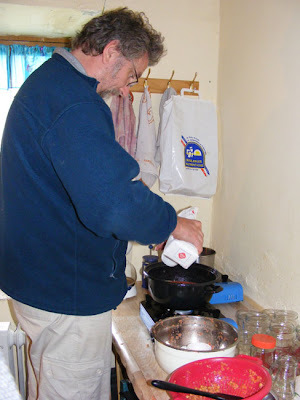 After a late start we spent the morning pottering around the house and making cherry cordial, with a plan to spend the afternoon at the orchard. Just as we were leaving home for the orchard the phone rang. It was the secretary of one of our friendly local menuisiers wondering if we were home, and if so could he come and look at our staircase hole. We jumped at the opportunity, because it's always good to get the artisans into your home and show them the actuality, communicate with hand gestures rather than awkward silences over the phone, and to play on their sympathy to try get the work done sooner. 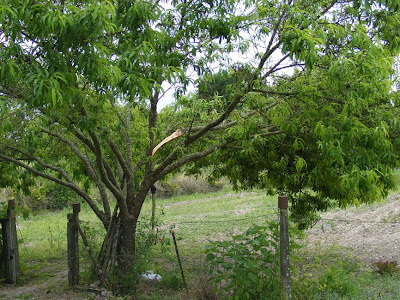 After he departed we hotfooted to the orchard, where it became evident that the combination of a huge crop of nectarines and the nice cooling breeze had conspired to try destroy the old nectarine tree that stands by our garden gate. The branch which broke had been going for a while - this we discovered once I had cut it all away and we could see where the water had been entering a split. It has made a huge difference to the tree (and to our crop) because the branch had torn in such a way that the limb it tore away from needed to be cut down too. For the cutting I used the saw that Martine and Christian had given us which made the job easy. We have now worked our way through the tree, removing part of its crop to lighten the load, and propping up a couple of branches to reduce the amount they sway in the wind. We hope this works, and that later in the year we can trim the tree back to manageable proportions without destroying it. 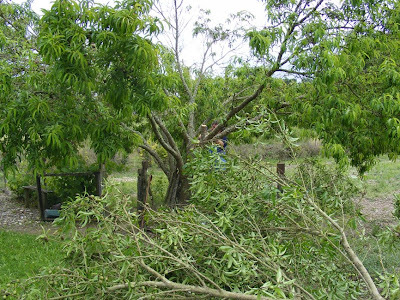 We took the damage to the nectarine tree as a warning and worked our way around the peach trees (6 of them) taking off the excess fruit and trimming away some dead branches. The peach crop looks as if it could be impressive this year, so losing 100 or so peaches isn't as upsetting as it could be. A Glimpse from Tours. I love the way these slates have been nailed onto the timber framing to protect it. Yesterday Susan and I had a big busy day over at Ken and Walt's for lunch. We haven't seen their blog entries yet, but I am sure the lunch will be covered. We're having a lie in today. There is a butcher's shop in the Grande Rue in Preuilly, but on Thursday mornings the butcher from Betz-le-Château is at the market in Place des Halles. When you buy meat from him it comes wrapped in custom printed waxed paper. I don't know what préparations bouchères are exactly, but since he always tells us that the saucisses aux herbes are made with marijuana, perhaps it is something to do with that. 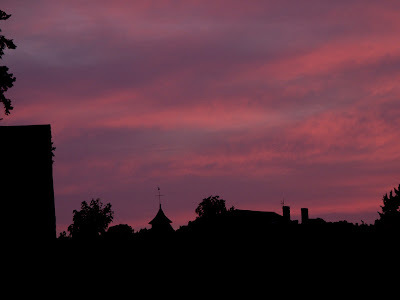 A couple of evenings ago Simon took this spectacular sky blue pink sunset. It's the view from our backyard. Simon always thought that the expression sky blue pink was peculiar to his family, but he says he heard someone at Barking station use the phrase one day, so we assume it may be an East London expression. After our shower Saturday afternoon our neighbours Sylvie and Pierre-Yves came over for apéro. 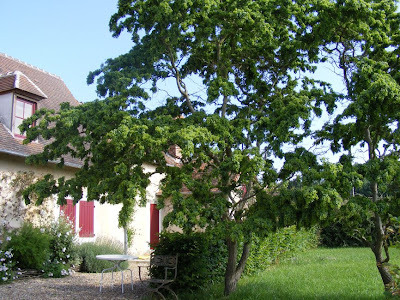 Sylvie and Pierre-Yves live opposite us and are doing a magnificent job of restoring their house and outbuildings. They have done courses in rendering using traditional materials and Sylvie has used the techniques to stucco their bathrooms really effectively. Their latest external addition the the house has been a beautiful stone wall and gateway, incorporating a salvaged iron gate we are quite envious of. They are both hard working and creative and are achieving a thoroughly professional finish on their property that we hope we can match. We treated them to Kir Cardinal - red wine with home made cherry cordial. Discussion ranged far and wide - from the different forms that electrical plugs take around the world to how to pronounce trou. We don't say trou properly - nowhere near enough lips-pursed action, apparently. Still - Sylvie was amused at our attempts and has just as much difficulty with English words where you don't move your face at all. The house in Preuilly is not their first attempt at restoring somewhere in the area, and they invited us to visit their previous home, which they have sold but are maintaining for the new owner. 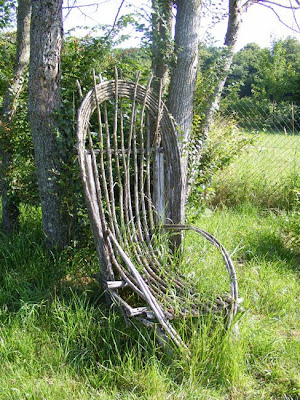 It is a fermette on the edge of the Forêt de Preuilly, and although we can understand why they sold it to move into town, we also appreciate what a wrench it must have been to do so. It certainly showed us what can be done with the old vernacular buildings – the place is a little piece of paradise. Sylvie is a keen gardener and gave us several plant divisions from the garden there. before, but it makes a most striking and attractive tree. After a café we came back to Preuilly and showed off our orchard and vegetable plot to them. We ate quite a few of the third bigarreau cherry (called Coeur de Pigeon) as it has just ripened. It's not as good as the Napoléon, but quite similar in appearance and more flavourful than the dark red Géant. By that time it was 1pm and Susan went up to the boulangerie, hoping it would still be open as we didn't have any bread for lunch. She got there just as the baker was pulling down the last blind. He saw her from across the Post Office square and signalled to her to ask if she was wanting bread. When she indicated she was, he very kindly unlocked the shop and she bought the last pain. After setting some cherries to macerate in sugar as the first step to making some more cordial, after lunch we headed off to Les Limornières, where they were having a plant open day. 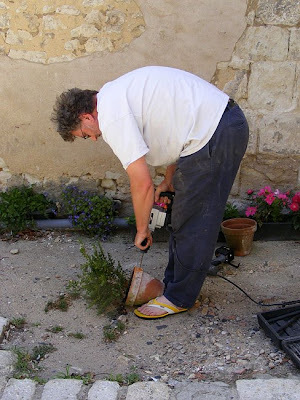 They specialise in affordable, tough, drought tolerant, locally adapted perennials suitable for maison secondaires. We bought an eryngium, a lavender and a helenium for a total of €8. 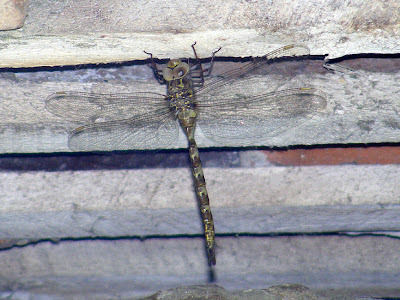 The garden there was buzzing with insects of all kinds, including a female Western Spectre dragonfly Boyeria irene. These are quite rare in Indre et Loire, although common in the Brenne, and it is a little bit unusual to see one hawking out in the open in mid-afternoon, as they are usually secretive and fly mostly in the evening, low and close to vegetation. In French they are called l'Aeschne paisible (= the peaceful hawker). They are also known as Dusk Hawkers or in German they are 'ghost dragonflies' and in Dutch 'twilight dragonflies'. Civilisation pops its head over the Parapet. The things is though, we can now do clean. As well as doing the plumbing, I had to add a 25Amp fuse to the fuseboard and run cable from the fuseboard to the water heater. This proved simpler than I was fearing (a big thanks to Alex for the advice) and it all came together with a minimum of fuss. 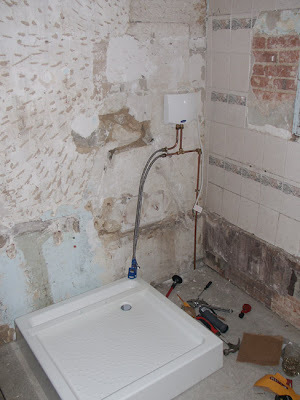 I was slightly concerned about the plumbing, because I experimented with using a push in joint to see how they go - it was slightly more expensive, but Tectite plumbing fitting seem to work without leaking. 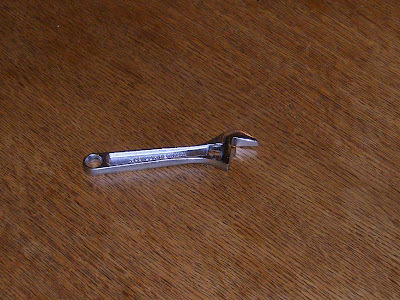 This means that for plumbing you don't even need a spanner any more! I then sacrificed my 4 weeks old collection of dirt to test the shower so Susan could feel confident in using it. I remain unfried. As it rained on Wednesday night we didn't need to water the garden yesterday, but we did go down to the orchard for half an hour to pick cherries. 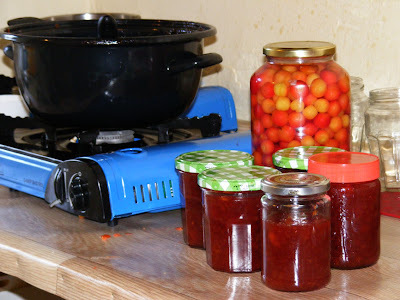 Yesterday Susan made 2kg into jam, 300g into coulis, and stewed a kilogram. 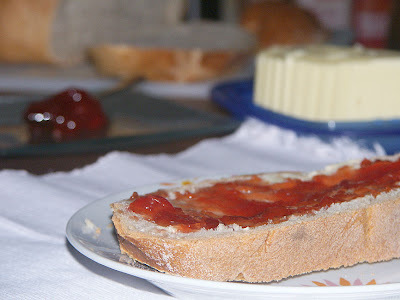 I made 2Kg into jam. On Wednesday night Susan made mini clafoutis. We also froze some whole and unprocessed to see what happens. The little guignes are thin skinned, fragile and sour, with translucent scarlet skins and yellowy flesh. They have a natural spiciness which gives jams and sauces a certain zing. 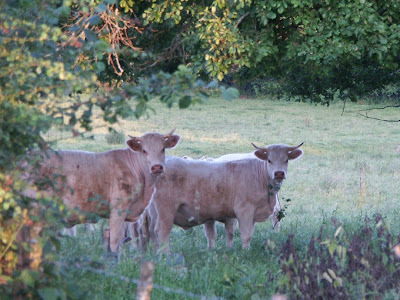 The bigarreaux are large and sweet, with quite tough skin and firm flesh. 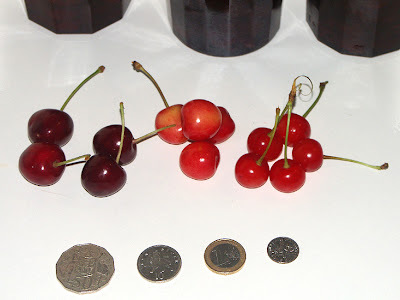 The Napoléon are by far the best cherry of these three to eat fresh. The Géant look the business, being a rich dark crimson, but they don't have the flavour of the bi-coloured Napoléons. Both the guignes and the Napoléons cook out to a rather pinky red. 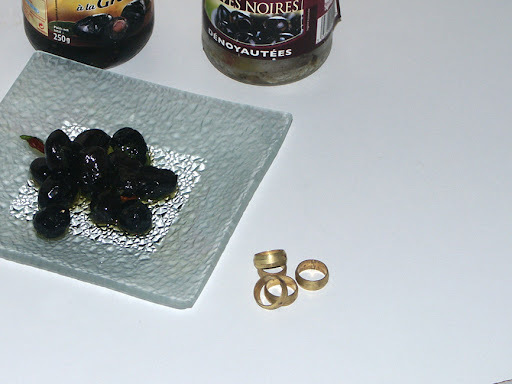 Adding Géant at the ratio of 1 part to 3 of guignes ensures that the jam comes out a satisfying red-black. PS We remain unwashed, as it seems that the silicone sealant for the shower takes at least 3 days to set. Sometimes Susan and I, completely by coincidence and without consultation, end up doing similar things in different parts of the house. Take Monday for example: we were both dealing with olives. Susan was taking them out of jars and repacking them with olive oil, chili, wild oregano and Ducros 5 baies. I was doing plumbing. It makes a change from cherries. 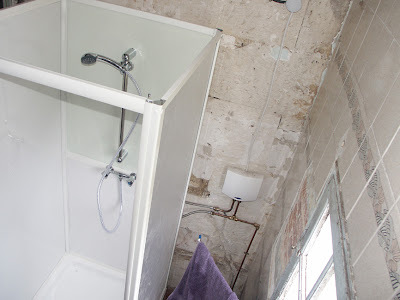 And talking of plumbing: I fitted the waste water pipes to the shower base yesterday, after buying quite a few wrong bits of 40 and 50mm plastic piping and using language. It's just as well half the people who live near here are old and wouldn't hear anything over the noise their TVs make, and the other half (including those who speak English) work during the day. We now have water to the shower, water from the shower, a shower and a water heater. We put the shower cabinet together yesterday after dinner and are waiting for the silycon to set before trying it out, I bought a 25Amp fusible and will be fitting that this afternoon, and then we can have a shower. Yesterday we met Martine and Christian, from Belgium. 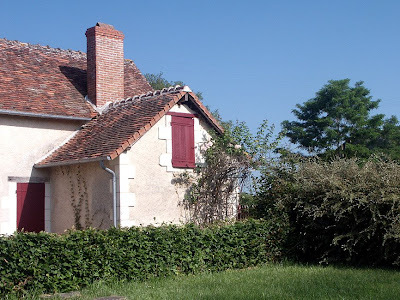 Martine blogs at Wishing I Were in France and found our blog through Living the Life in Saint-Aignan. They came to have apéro in what Martine dubbed our 'fairytale dining room'. As with all our visitors recently, we offered them our new apéro de la maison – kir made with our home made cherry cordial. They chose to have it with white wine, Simon has taken to having his in red wine, making it kir cardinal. After apéros, they rummaged in the boot of their car and produced a wonderfully generous array of gifts. There was a box of chocolates, of course, but also a spade and pruning saw for the new garden and a screwdriver set and some screwdriver bits, a pair of multi-grips, a fret saw, work gloves, carpenters' pencils, and a file. Christian works for a big tool company and all the tools are good quality brands (Spear & Jackson, Bahco). We couldn't believe our luck! 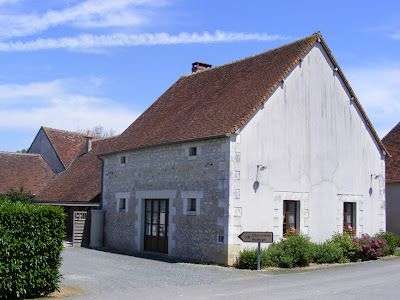 Martine had scoped the area via the internet and decided on a restaurant for lunch – a ferme auberge near Betz-le-Château, about 20 minutes away. Fortunately we decided to phone ahead to let them know we were coming, or we might have found a locked door. We were the only customers and the patron said it had been a very strange month, very slow. 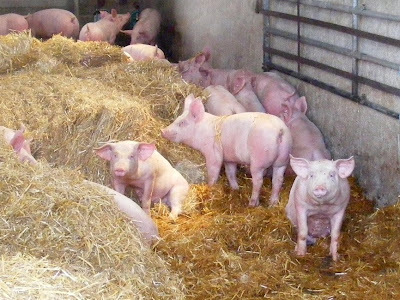 The Ferme Auberge de Bournaichères raises pigs and makes pork products. Their rillettes and boudin noir are extremely well regarded, and as well as the restaurant they have a shop on the farm selling their products. 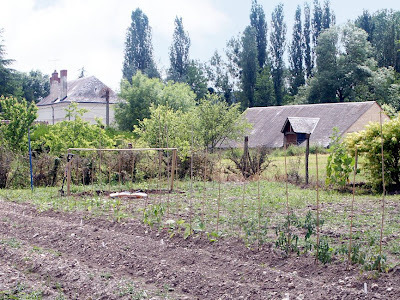 Ferme auberges are required to serve meals from ingredients largely produced on the farm, which means that you are generally not offered a choice of dishes. The meal started with a rillette. The patron seemed concerned that we didn't eat enough but we assured him it was because we were pacing ourselves and looking forward to the next course. The main course was the most amazingly tender pork escalopes, cooked in a little cider and flavoured with thyme. There were a few little half champignon de Paris in the sauce too – the chef was apparently ringing in the changes today, as usually this dish was served sans mushrooms. A cheese course followed, with a camembert, a Sainte Maure de Touraine and a brébis from the pays lochois. The camembert was quite strongly flavoured and we liked the brébis very much. The Sainte Maure, of course, is our local cheese, so we have it in some form or other several times a week, and love it. We laughed when we saw the dessert – a simple bowl of fresh dark cherries. We told the patron that we had spent the last week picking 30kg of cherries from our own orchard. He said that he had that quantity in the freezer alone, and that his grandfather had planted the trees. Then he went off and fetched an alternative dessert of generously sized crême brûlées in attractive hand made bowls. Naturally we ate both cherries and crême brûlée. The restaurant is open and airy, with big solid wood tables and chairs. The patron is chatty and amusing. The food is simple and excellent. The cost per head was €11.50, and included unbranded wine and coffee – sensationally good value. We had a great time and are really glad that Martine suggested we go. We didn't know of the restaurant before she mentioned it, and it could have been ages before we discovered it. We really enjoyed Martine and Christian's company, and hope they visit again. 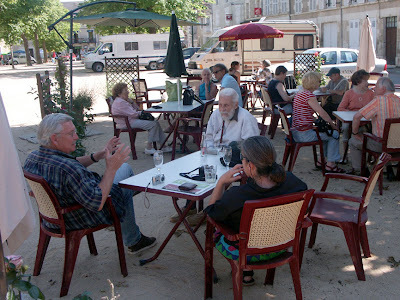 They are such nice people that they have made many friends in the Loire over the years, as they holiday here most years. 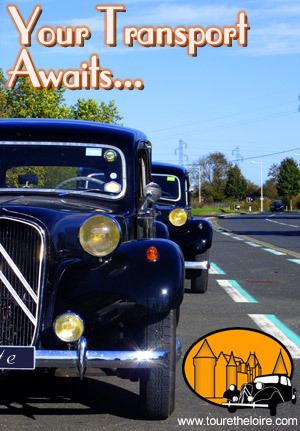 These days they spend their holiday driving from friend to friend and meal to meal. After saying goodbye to us, they were off to Vouvray to have supper with a chef friend with a huge wine collection. And in cherry news: I stewed 2kg of guignes and froze them, and made clafoutis. We picked 3-4kg of bigeareau and another 2-3kg of guignes. I think I'll make some little individual clafoutis and freeze them and another batch of jam. Plumbing is easy, assuming you have a shifting spanner, the necessary vocabulary, and infinite patience. The best spanner to use is a really big one. This means you can tighten stuff up so tight no water can escape. This is a desirable thing. Patience. This is important, because everything that can go wrong will (twice), and it can get really tiring retrieving your spanner every time you thrown it away in disgust. First thing to do when planning some plumbing is to plan. Planning means that you only have to return to the hardware shop twice after having bought the wrong stuff. Not planning means that you use so much petrol returning to the hardware shop that getting a man in would have been cheaper. The best way to plan is on the back of a beer coaster with a pen that runs out half way through, but any scrap of paper and unreliable scribing instrument will suffice. to remember what stuff means. Once you have a plan write a list of what you need on a piece of paper. It is best to get in the car and then ask your spouse if they have the list (repeat process as required). 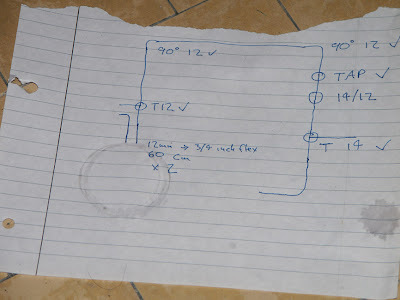 If the paper is small enough and gets lost between home and the hardware store you can be creative when you get there. When in the hardware store, your vocabulary will come in useful, but only if spoken under your breath. Assuming you have any breath after seeing the prices. Walking around muttering and looking perplexed is de rigeur in the plumbing aisle, so don't worry. Once you get your bits home, they are best sorted by spreading them out all over the kitchen floor. This shows everyone in the house that you are working and a man not to be messed with. 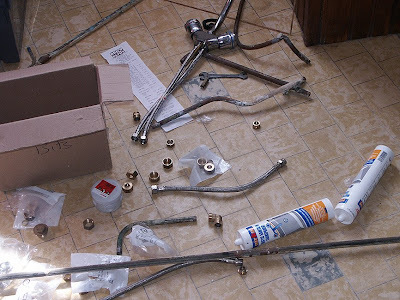 Return to the hardware store and exchange the bits you have bought that are the wrong size (you can do this if you haven't been a coarse plumber and opened up all the packets), then lay your plumbing bits (angle pieces and T-pieces and all that caper) out so you are sure you have what you need. Return to the hardware store and buy the one piece you forgot about, then start work. Bits. Don't get 12Ø and 14Ø mixed up. Next, turn the water off where it comes into the house. An impromptu cold shower will not improve things. Once you start work, it's a piece of cake. Vocabulary will help, as will not throwing your spanner too far. If you must throw the spanner, don't hit a window, because glazing is even more finickity than plumbing and you don't want to go there. Once all the bits are connected turn the water on slowly. Joints will leak, so turn the mains tap off again and REALLY give them a tighten. Repeat the last two steps until you can flush the toilet without every pipe in the place making like the Versailles fountains. Yesterday was a busy day: Alex and Nicole came over to have a look at our back garden with a view to Alex amenagement'ing it (terraces are needed); then we went to bricomarche for my first return to the hardware shop to buy the rest of the plumbing bits for the shower; then I did some plumbing, then we picked 5Kg of cherries to go with the 3Kg we picked yesterday, making 29Kg so far with 2 of the 7 trees picked; then Bengt arrived and donated us his old portable electric hotplates (he now has a proper cuisinier); then I did some more plumbing; then I made cherry cordial. The basic recipe for cherry surprise cake is one that you will find on a number of French cookery sites. 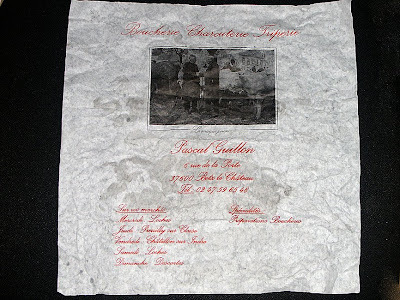 Kristin Espinasse from French Word a Day has posted Uncle Jacques' version, and Clotilde Dusoulier has put her mother's on Chocolate and Zucchini. The cake recipe is all about ratios – un : deux : trois – so very easy to remember. Take un individual pot of plain natural yoghurt and, using the now empty yoghurt pot as a measuring device, mix it with deux pots of sugar* and trois beaten eggs. Stir in trois pots of plain flour, a pinch of salt, 1½ tsp baking powder and ½ tsp bicarbonate of soda. Tip in une pot of vegetable oil and mix thoroughly. Pour the batter into your buttered cake tin/s of choice and cook for at least 40 minutes at 160°C. The small cakes I did in old pâté dishes (12cm x 9cm) took 40 minutes, but the bigger cake in a silicone log 'tin' (20cm x 10cm) took an hour in our mini oven, and needed a piece of foil over the top to stop it burning. 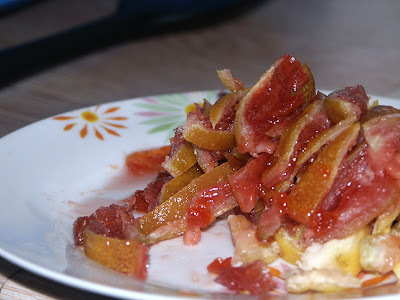 Well, the cake doesn't have cherries in it, but I did add a by-product of our cherry processing – the half lemon skins that were added to the jam for extra pectin. They have been candied and taken on some of the cherry colour so are now an appealing pink. I cut them into slivers with the scissors and added them to the batter prior to pouring it into the cake tins. The result is a rather moist cake which has maturing well over a day or two, and while some of the pieces of lemon are a bit chewy, the lemon-zesty-with-hint-of-cherry flavour is an excellent addition to this homely cake. *French supermarkets stock extra fine castor sugar (sucre poudre très fluide) which I am really enjoying using. It comes in a packet with a pourer and I have been pouring it into jars with a few coffee beans, cinnamon sticks and vanilla pods that have been used once or twice before but still have something to give. After only a few days the spices will have imparted their lovely flavour and aroma to the sugar and it can be used. Note that this sugar does contain an anti-caking product (silica), but I am under the impression that silica is a harmless food additive, as well as occuring naturally in the skins and cell walls of many grains and vegetables. 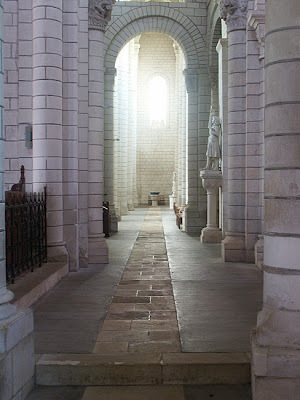 Compared to the church shown in yesterday's photos, the abbaye in Preuilly sur Claise is subdued, almost austere. They date from about the same time, but Preuilly's church was restored in the 1860s (around the time when the belltower fell down). We have a picture of the church with its old belltower (and an interesting story) here. 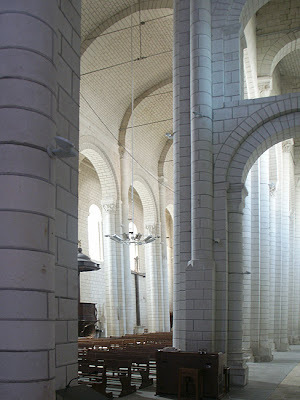 There is no record (as far as I know) of Preuilly's abbaye being decorated in a similar fashion to St Savin's, but painting walls and ceilings was very much à la mode. 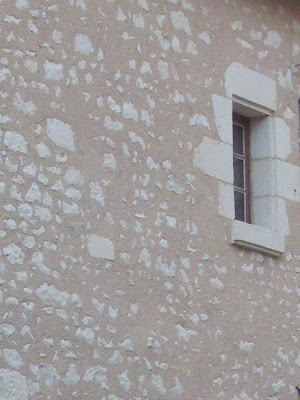 There is a date over the door of the Abbaye: 1009. 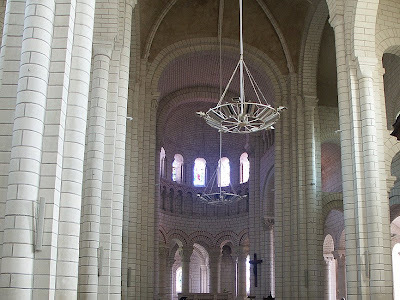 Although there was a big celebration in 1909, as far as we can tell there is nothing special being done for the 1000th anniversary of the foundation of the abbey. The current building dates from the 12th-14th Century. Yesterday we didn't do a lot - I have cherry picker's shoulder, so apart from some light housekeeping and a lot of thinking it was a quiet day for me. Susan did a lot of cooking (cherry based), so the motif for June continues. 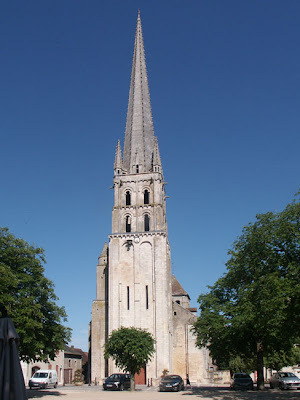 We have been to St Savin a number of times, but not since the restoration work on the 12th century paintings has been completed. So when Ken and CHM visited us on their way to there we took the opportunity to tag along (as it were - I drove). The restored church is a lot more open and airy than I expected, the previous times we visited it was filled with scaffolding and temporary walls and you got no real idea of the scale of the thing. 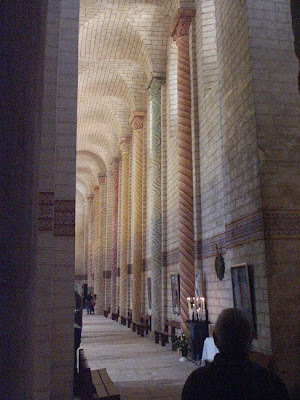 We were impressed by the "candy cane" columns, which have been painted much in the manner they would originally have been painted, but in muted, faded colours rather than the poke your eye out variety favoured by previous generations of restorers. This is not to say the church is perfect - there was a quite appalling "installation" artwork with sub John Williams atmospheric movie score soundtrack. This has not gone down well with visitors, as evidenced by all but one of the comments in the visitors book. CHM knew St Savin well and while we sat in the garden behind the church told us something of the family who lived in the "Chateau" which is attached. He spent some time there as a child, including when he was evacuated from Paris during the 1939-45 unpleasantness. In a comment on a previous blog entry CHM said "This part of the abbey was known as the "château" and was the property of M. Édoux, of "Ets. Édoux-Samain," a Parisian lift or elevator builder of the late 19th and 20th century who was a friend of my father's. 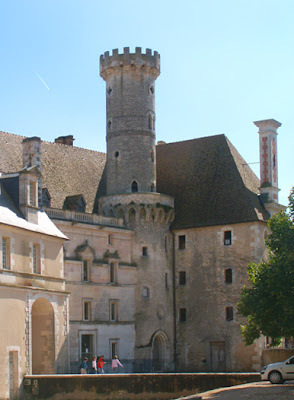 M. Édoux built this faux medieval tower to encase a hydraulic elevator, what else!" After sitting in the garden and watching the swifts whirling and swooping we adjourned for refreshments (lunch, having been taken at least 3 hours earlier, had worn off). We had a really pleasant, relaxing, but very informative afternoon with good company in pretty surroundings. What more could you ask for on a perfect late spring day? PS. The morning was spent making cherry jam. We have to do our chores... This morning Susan will be making sauce from the last of the cherries we have picked. Unfortunately, it's raining, so we can't go and pick more cherries today. We only picked 3Kg of cherries yesterday. This was because most of the morning was spent at the brico shop, and the afternoon was taken up using the stuff we bought at the brico shop to make a support for our boysenberry bushes/vines/whatever they are. Then we picked cherries. I have a new technique, which involves climbing into the tree, grabbing a branch, and shaking like a madman. Then all the cherries drop onto Susan's head and she collects them. It beats climbing ladders and plucking the cherries delicately from the branches. That means we have picked 21kg so far, with probably another 11 - 15Kg left on the two trees we have been picking. Next week the two trees with big cherries will need picking, then hopefully we will get some respite before the last two trees need doing. We're keeping our fingers crossed that the peaches and nectarines won't be ready for about 6 weeks after that so we can get something besides picking fruit done. Susan stewed 2Kg of cherries this evening, and I made 500ml of cherry syrup concentrate with another kilo. (Actually it's Cherry and Grand Marnier ice cream topping). If we don't process the fruit when we pick it we will never keep up! When we went to the brico place (that's a hardware shop to you non french speakers) I took a list written on my new French shopping list book. There are some things you just expect to be the same all over the world. I mean - notepads: it's paper in a block with some sort of binding, and sometimes they have lines on them to help you write in a straight line. How many ways are there of doing this? One, you would suspect - the way it is done at "home". Imagine our surprise to discover that cultural assumptions can be misleading even when it comes to a notepad. First of all I was excited to see that the French are obviously technical and use a lot of grid paper for planning stuff on. 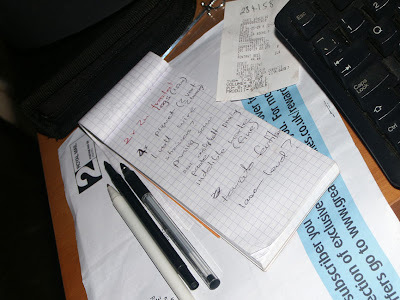 Then I was frustrated because although there was a lot of grid paper, there was no lined paper. Then I was bemused to realise that the grid paper was lined paper - but lined both ways. I assume this has two benefits – it means that the notepad makers don't need to retool between making notepaper in landscape and portrait aspect, and if you put one letter in each box you end up with very neat writing. Doing the shower should only take a couple of hours, so I expect to be struggling with it all next week. It will not surprise you, avid reader, that yesterday being a pleasant sunny day, we went and picked cherries. We had a picnic between bouts of picking, and I pruned the trees, which made picking the trees easier (the branches were on the ground) and will make picking cherries easier next year too. Boil until sticky and sort of sauce consistency (or about 104°C if you have a jam thermometer). This is my own recipe wot I made up all by myself and I am right chuffed wiv it. We had it with chèvre at apéro time and it was pronounced a success. Our friend Chris (who is a proper chef and everything) said it did the job nicely. The chevre was bought by Susan at the market this morning, and was the strongly flavoured plugs from the cheese molds we first tried in May a couple of years ago. 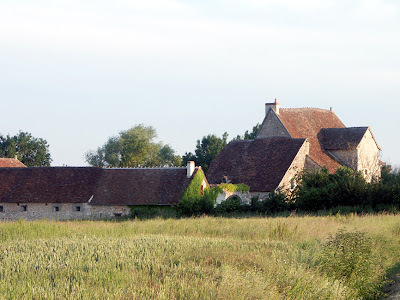 The chèvre maker farms at Champ d'Oeuf near Martizay and has a webiste here. 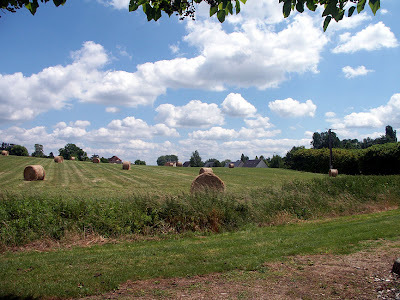 Here are some pictures from another of our favourite walks around Preuilly. Going out of town up Route C1. 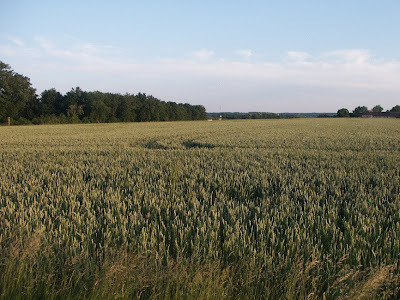 The wheat crop at La Pouët. (Zone Artisinal or Light Industrial Area). for a quieter, safer walk. A link to the map showing the full route of this walk is here (in red). Susan wrote yesterday about the cherries and our plans for them, and today we finished processing the first 10KG (that's 22lb). That leaves about 30kg (at least) on the trees. Getting to them and then picking them will present a challenge, but not as much of a challenge as using them all. First of all today I stewed some cherries (about 3kg) with a little sugar to stir into yoghurt or crème fraîche (or maybe even fromage blanc) as the whim takes us. Susan had already put about 1kg of cherries in a jar and topped it up with preserving alcohol so we can do cherry liqueur, which still left a pile of cherries to think about. I've had a haircut, too. I decided to make jam, and settled on David Lebovitz's "No Recipe Cherry Jam" recipe. The only real variation from the script was that I boiled the fruit and then passed them through a colander rather than pitting them (I don't have a cherry pitter), and as well as adding the juice of two lemons I put two lemon halves in the jam to cook. Jam (and booze), all cherry flavoured. The results are ever so slightly too lemony for my taste, but that zingy tartness does stop the jam being too icky. We had it for breakfast this morning, spead on fresh boule with a little butter and it was good. I mean really good. This was my first ever attempt at jam making, so I am quite pleased with myself. And best of all? There is still 1kg of cherries left - to go into alcohol with sugar and spices. So for now, that's the cherries sorted. What isn't sorted is our computers. The plan was to put two computers online, so Susan can do work without interrupting the important stuff like blogging and looking up recipes, the cost of floor tiles, how to do plumbing and a million and one other things (watching and/or listening to the cricket, for instance). Our problem is that although I am quite computer literate, I know nothing about networks, and am not well disposed to the thought of learning about it on top of all the other things I am trying to learn. 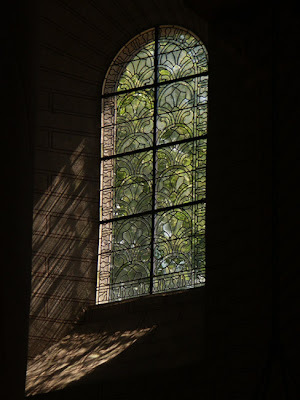 Note from Susan: Simon told me he didn't have time to sort out our network, so I got in touch with the IT guy at my office in London, and Bob Toovey, who I've come across in the blogosphere, to see if they could help. Bob runs Computing in France, and responded very quickly to my email. After a short email exchange, I then rang him and he spoke to Simon, checked what gear we have, whether we were using the right cables, what type of modem we have and so on. Bob made a few suggestions, including contacting our ISP, which I have followed up, and Robert, my work IT guy sent some useful links, so between them, I am sure we can make it work eventually. Looks like we do need an extra bit of hardware though.